, Tope Folarin, and Mike Curato—had one hour to create the story, based on an opening line submitted by Docs user Lauren Lopez in Malaysia. You can read the final story at g.co/docsnano, and watch their unedited process and Q&A in the original Hangout on Air. Last month, we partnered with National Novel Writing Month to see what happens when three writers come together, online from three different cities, to create a short story in Google Docs. The three authors—Edan Lepucki, Tope Folarin, and Mike Curato—had one hour to create the story, based on an opening line submitted by Docs user Lauren Lopez in Malaysia. 90,000 hours. That’s the amount of time the average person spends working during their lifetime. To put that in perspective, if you spend 90,000 hours watching movies and did nothing else — no sleep, no breaks — you would be watching for 10 years non-stop. Since you spend so much time at work, we want you to have the latest Google Apps updates when they're available to make working easier. That means your apps are constantly being updated with new and helpful features almost every week to ensure you have the latest tools, security updates and speed improvements — as soon as they’re ready. And that applies across the Docs editors as well. So as a busy 2014 comes to a close, we want to highlight a few of the new ways get things done with Docs, Sheets, Slides, Drawings and Forms. You come across all types of files all day. The last thing you want to worry about is what software you need in order to view or edit these files. For this reason, we made it so you can open and edit Office files directly in Google Docs, Sheets and Slides, on your desktop, phone or tablet. Editing files in real-time with others is a great way to work together across the Docs editors, and many of you asked for the ability to suggest changes in other peoples’ documents, rather than making edits directly. Now you can do just that with Suggest Edits in Docs. Make suggestions that can be accepted or rejected with a single click. And when you convert a Word file to Docs or vice versa, your tracked changes will convert as well. Work on any of your devices. We created new mobile apps for Docs, Sheets and Slides across Android and iOS, where you can edit your documents, presentations and spreadsheets on the go. While working in the cloud means you have access to your documents on any of these devices, you can still access or create documents even if you don’t have a data or WiFi connection. Edit your images directly Sometimes the best way to convey a thought is visually and you need your images to look just right, which is why we made it easier to edit and adjust images. You can now crop your images, even masking the crop to specific shapes, and add borders in Docs, Slides and Drawings. Plus, you can connect objects and images in Slides and Drawings, recolor and change opacity of images in Slides, and even add effects. Get things done faster We want to help you take care of your common tasks. And you know what lots of people make in documents? Bullet lists. So now, just type an asterisk (*) and it will automatically become bullets in Docs and Slides. Nobody likes having to do the same thing twice (unless you’re Santa) so just copy and paste your charts between different spreadsheets in Sheets. For all the regression lovers out there, you can also add trendlines, and to further visualize trends, you can add miniature charts, or sparklines, into individual cells. Get answers to your surveys Forms is a great way to gather information, and across 2014, we added lots of new ways to ask questions and get answers. You can customize themes in Forms to add your own flare and create short URLs that are easier to share. There are also lots of new question options, like limiting one response per person and shuffling the answer order. Add tons of functionality from 3rd parties Add-ons for Docs, Sheets and Forms are tools created by developers that help you do those extra things you need help with, whether it’s printing mailing labels or adding MLA-approved citations, right from your document. Let there be tables You can add borders and backgrounds to your tables, and merge cells together to get your tables to look just how you want. And when you convert your legacy files to Docs, the table cells and borders will still be there so you can keep working. And let everyone, including blind and low-vision users, get work done Across Docs, Sheets, Slides, Drawings and Forms, it’s much easier to use a screen reader, with better text-to-voice verbalization and improvements to keyboard navigation. You can now use braille support to read and enter text in Docs, Slides and Drawings. And you can collaborate easier with others in Docs, Sheets, Slides or Drawings because screen readers announce when people enter or leave the document, and you’ll hear when others are editing alongside you. We’ll continue to make a ton of updates behind the scenes to ensure everything keeps running faster and smoother next year. Four cheers (Docs! Sheets! Slides! Forms!) for a happy work life in 2015. Use Forms to make it easy for friends and family to send you their most recent mailing addresses. Just create a quick form and email it out or post the link on social media. Everyone’s addresses will be neatly added to a private spreadsheet. 2. Now that you’ve got your addresses up to date—print out mailing labels. Use the handy Avery Label Merge add-on to pull your holiday card addresses from Sheets into an Avery label template in Docs. Pop your labels into the printer, hit print and start sticking! 3. 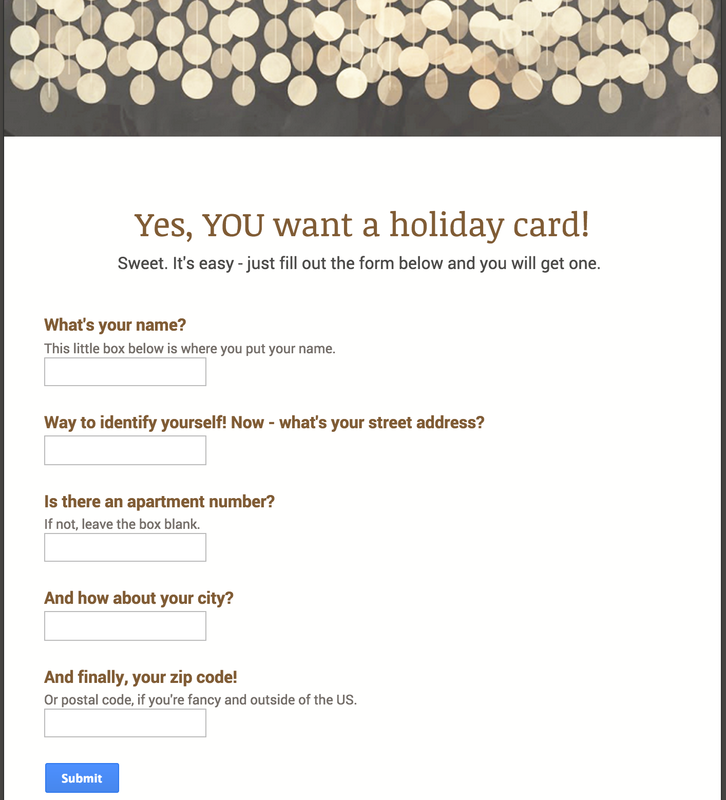 Send a digital, collaborative holiday letter with Docs. If you’d rather send holiday letters instead of cards, Docs can let everyone in the family contribute, no matter where they are in the country or the world. Just create a doc, give everyone edit access and write your card together (and leave your thoughts and opinions with suggested edits & comments). When it’s ready to go, you can publish it and share a link, or go old school and print and mail it out. 4. Give your documents and presentations a holiday touch with royalty-free images. Choose from a bunch of free holiday-themed images in Docs and Slides to make your holiday projects a little more festive. Just click Insert > Image > Search > Stock images to browse. 5. Create visual wishlists to share. 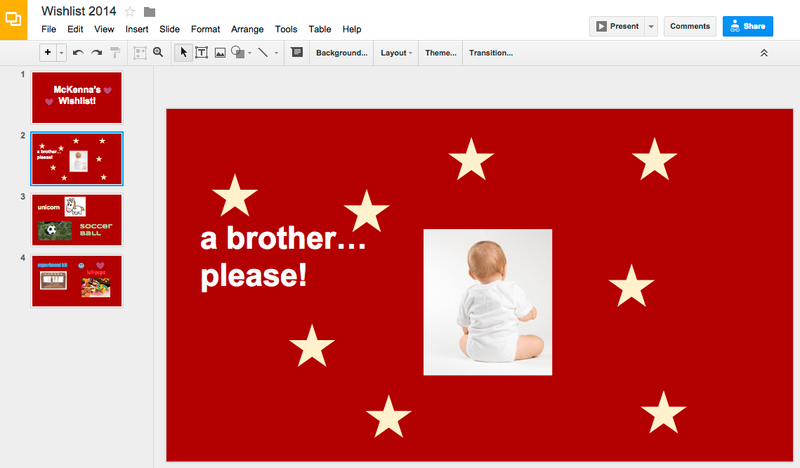 Have a bit of fun with your family's holiday wish lists by making Slides for Santa. Share these visual wish lists with anyone who’s looking to pick up something for your family. The Docs editors don’t just make things easier at work—they’re handy for helping you get stuff done at home too, especially around the holidays. We’ve rounded up five ideas to help you focus on the cheer—we’ll take care of the rest. 1. Sending holiday cards? Refresh your address book first. Today we're making two updates that make it even easier to work better—together—in Drive and the Docs editors. After you add an email address to the sharing dialogue, you’ll see profile pictures for everyone you’ve added. This can come in handy when you need to confirm that you’re inviting the right contacts, especially if you work with people that have similar names. It’s also quicker to find all the people you need to share something with. 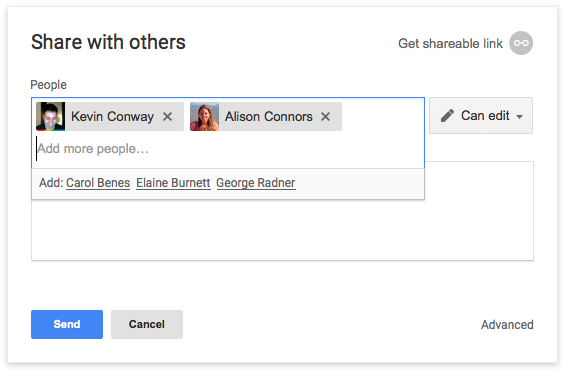 Once you add two collaborators, you’ll see suggestions for related people who you frequently email or share files with. For an overview and tips and tricks about sharing visit the Help Center. Having trouble keeping track of the flight itineraries your children are sending your way? Maybe you just need a central space to store photos from a family trip? With Google Drive, you can organize your stuff into folders so you can easily come back to it. To create a folder, click New in the top left corner of Drive, choose Folder, and name it. From there, you can drag and drop your stuff into it or right-click a file and choose Move to to add it to a folder. Now the need to dig around your desktop is gone! Have a pie recipe that you want to send to others? Quickly share it straight from Drive. You can even decide whether the people you are sharing it with can edit, comment on, or simply view what you send them. That way, you can keep your grandson from “accidentally” adding an extra pound of sugar to your recipe. To share your recipe (or any other file), select it in Drive, click the Share icon and add the email addresses of the people you want to share it with. Next to the addresses, choose from the drop-down menu which level of access you want people to have (e.g. edit, comment or view). Then let the family bake-off begin. When sending invitations to your family’s annual holiday party with Gmail, you can also add a big file straight from Drive, like the home video you put together for the occasion. Adding the file from Drive keeps you from using up storage space in Gmail and allows you to control who has access to the file you’ve included. When writing an email in Gmail, you can add a file from Drive at any time by clicking the Drive icon at the bottom of the email and choosing a file to add. Now everyone can see that video showcasing your unparalleled baking skills. Relaxing with nature doesn’t mean you shouldn't be able to see your photos or keep working on the holiday newsletter. Before you lose access to your Internet connection, simply sign in to your Chrome browser and visit drive.google.com. That way, anytime you lose Internet or WiFi, you can just go back to Drive in Chrome and your files will be immediately viewable offline! You can even edit your Google Docs, Sheets, and Slides offline, and all the changes you make will be saved for when your Internet connection comes back. That way, you can enjoy the end of fall without falling behind. Whether you’re in your living room or at the holiday party, on your laptop or your phone, you’ll never be without the ability to show off your family photos with Drive. You can download the Drive app for your Android or iOS device and have all of your files available on your phone or tablet — even offline. On your Mac or PC, install the Drive app so files in Drive are synced to those devices, too. As always, Chromebooks automatically use Drive to store files so those all important shopping lists and recipes are safely stored and available from anywhere. It can be difficult to keep track of all your receipts when you’re at the mall doing holiday shopping. With the Drive app for Android, you can scan all of your receipts directly into Drive so that you can easily organize them when you get home. To scan a receipt or another file, open the Drive app, click the plus (+) sign in the bottom right, and click Scan. You can then scan the item with your phone’s camera and it immediately gets uploaded to your Drive. And with that, no more boxes of receipts to sift through on Tax Day. Impress the loved ones this holiday season by staying organized with Drive, regardless of whether you plan to travel cross-country to visit family or simply spend a few days at home in comfortable sweatpants. The holidays are a great chance to reflect on your year and spend time with family. They can also provide extra stress when planes get delayed, cookies burn, and family photos go missing. This holiday season, try these 5 tips for using Google Drive to keep yourself and your family organized, connected, and above all, happy.